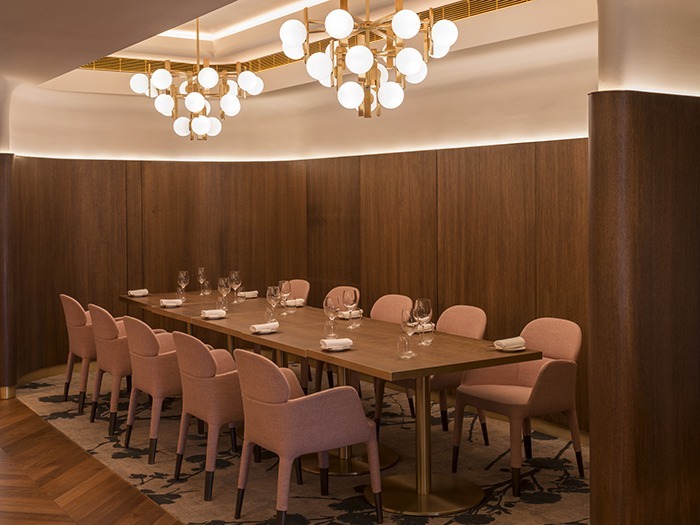 Foundry recently designed the lighting at Glovers Alley, a new restaurant within the five-star Fitzwilliam Hotel in Dublin. The brief from the client was for a sophisticated and glamorous restaurant that meets the conflicting requirements of both fine dining and hotel breakfast service. Foundry lived up to this brief by using fluid lines and luxurious materials to create a sequence of intimate spaces in an elegant whole. 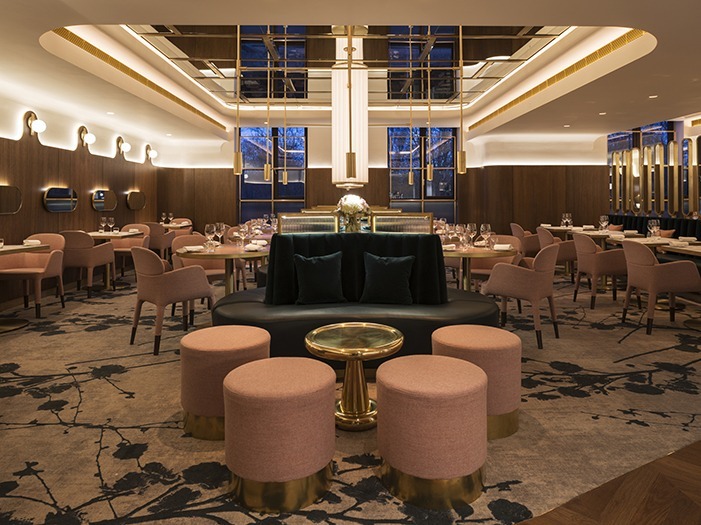 The glamorous yet informal interiors are defined by linings of rich fumed oak and brass, coved plasterwork and Deco-Pastel leathers. Lighting design was integral to this interior concept and called for a combination of statement feature lighting to add scale, richness and interest to the interiors and architectural lighting to highlight form, structure and surface. The lighting had to deliver a variety of moods from a bright and breezy breakfast to an intimate and middy late evening setting. The feature and decorative lighting were initially sketch designed by Project Orange before being developed in collaboration with Foundry, who then took on responsibility for detail technical design and fabrication. The central feature presented challenges in that it required millimetre perfect coordination with the mirrored ceiling in which it is reflected, seemingly doubling in height. The restaurant fittings comprise a comprehensive family of brass and glass sconces and chandeliers that combine continuity with variety and provide visual interest throughout the space.